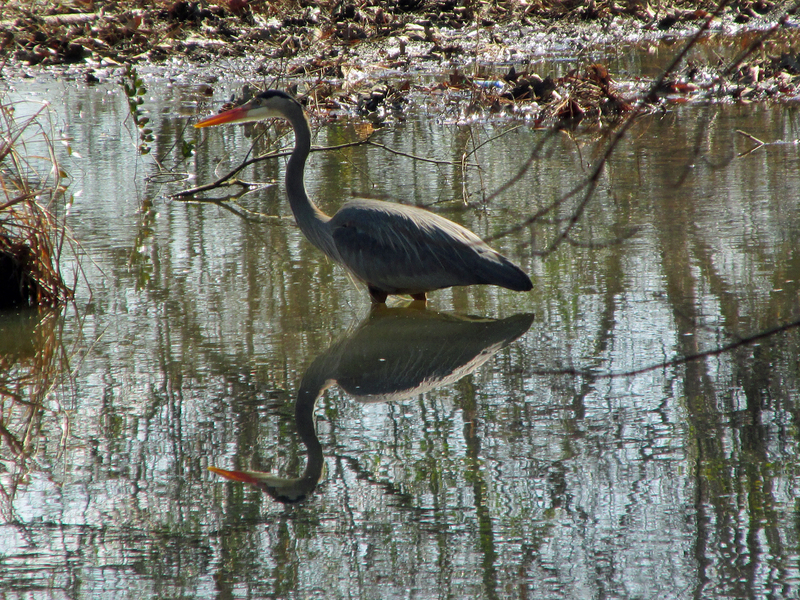 Photos by Bryan Stevens A Great Blue Heron wades in a pond along a woodland park trail. I enjoyed a recent trip to Pawleys Island, South Carolina, which gave me an opportunity to see some birds rarely encountered here at home. By the end of my seven-day stay, I’d compiled a list of 93 species, most of them seen at Huntington Beach State Park and Brookgreen Gardens. If you ever get an opportunity to visit either of these attractions, I’d encourage you to take it. Even if you’re not a birding enthusiast, the park and gardens are fascinating destinations with a range of activities available to visitors. For me, it was a week of snapping lots of digital photographs and trying to cover as much ground as possible. Under such circumstances, it’s easy to forget to take time to find a moment to stop and simply enjoy. I had such a moment present itself while exploring a nature trail within the grounds of Brookgreen Gardens. After taking a couple of photos of a flower blooming in a wetland created from what was once a rice plantation, I filled up my camera’s memory card. I didn’t have a spare card with me. Of course, I was irritated with myself for forgetting to bring a back-up card. I found a seat on a bench shaded by overhanging trees draped with the ever-present Spanish moss. The bench was positioned to look toward a quiet cove near a deck built over a creek for the purposes of nature observation. I had only been seated for about a moment when a great blue heron landed only a few yards away from me. 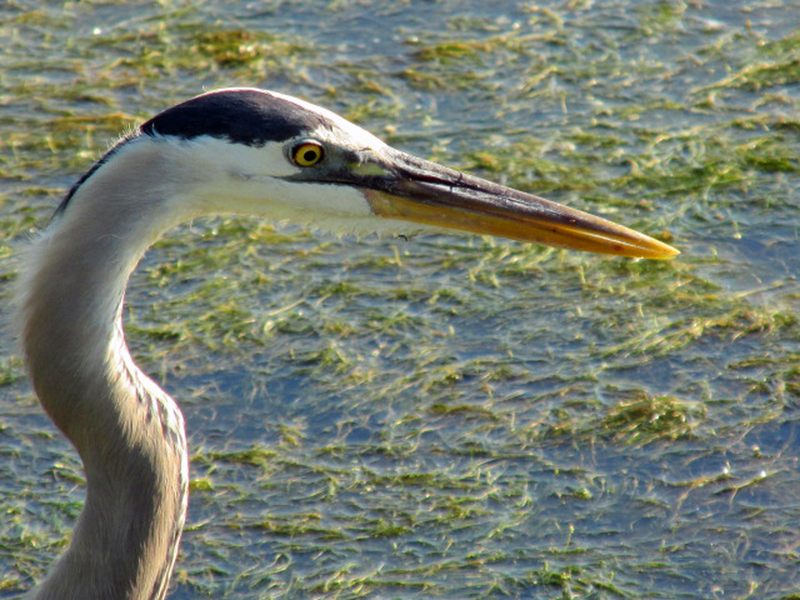 A Great Blue Heron is a study in patience as the bird waits for a fish to get within striking distance. The heron almost immediately noticed my presence. I hardly dared to breathe, let alone move, because I wanted to prolong this close proximity with the large wading bird. Keeping a watch on me, the heron shuffled along the water’s edge. Obviously, the hungry bird was reluctant to cede this prime fishing hole to me— or any other competing angler. As we both relaxed, I found myself fascinated with watching the bird’s careful, almost dainty, steps through the vegetation choking the edge of the deep creek. A few insects buzzed around my head, but I resisted the urge to slap at them. I also tried to send positive thoughts to the bird. I formed messages in my head that could have come from a sci-fi movie of first contact, such as “I mean you no harm.” I also “informed” the bird I wanted nothing more than to observe, which was technically true since I no longer had the capacity to store any photos I might have taken. Still wary, the bird began to divide its attention between me and any potential aquatic prey to be found in the water. That’s when I also began to communicate wishes for successful fishing. I’m not particularly given to these sorts of whimsy, but I felt rewarded that the heron had been willing to trust me so far. I didn’t really need a camera to record for memory the large bird’s actions. On a couple of occasions, the heron stabbed its bill into the water lilies and other aquatic vegetation along the creek’s edge. It even caught a small fish that quickly disappeared down the bird’s long neck and into the waiting stomach. Even in the shade, it was still rather warm. Welcome breezes would often blow, cooling me and ruffling a few of the heron’s feathers as it continued to explore. If I had attempted to photograph the scene, the bird would have been frightened and departed. I might have gotten one photo, but the intimate observation would have ended prematurely. This almost happened despite my efforts to remain unobtrusive when I heard voices and realized a couple was walking the same trail. It was, after all, a public trail open to all visitors at Brookgreen Gardens. I expected that their arrival would spook the bird. I was delighted to be wrong. The bird again shuffled to the far end of the small cove. The couple didn’t even notice the heron until they had almost drawn even with the bird’s position. They remarked on the bird, then continued their walk. I smiled at them as they passed and eventually moved out of sight. The heron returned. I watched the bird for a few more minutes. Then, rising slowly, I turned and walked off in the same direction as the couple. By now, the heron had moved farther out to the mouth of the cove. In an experiment, I walked to the location where the bird had first landed. I counted out each step in my head. It took 20 steps to move from the bench to the place where the heron had landed on its initial arrival. 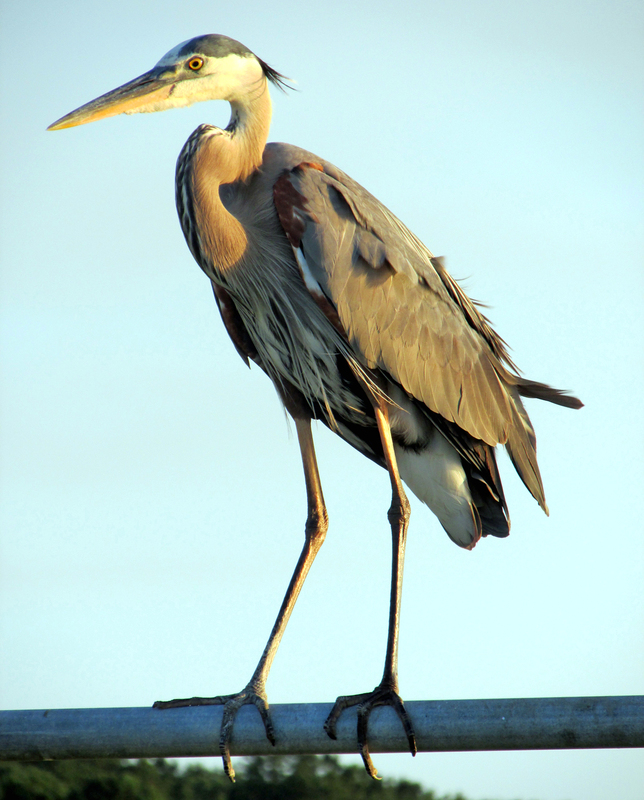 A Great Blue Heron perches along the causeway at Huntington Beach State Park in South Carolina. I had been within 20 steps of the graceful, beautiful bird. I’d gotten to share its personal space for a short interval. Of course, the bird has probably grown accustomed to people since Brookgreen Gardens is a well-visited attraction. But even the most “tame” wild birds maintain an inviolable sense of personal space, so I still felt I’d accomplished something with the short interval I enjoyed in the company of the heron. Keep in mind that everyone enjoys birds for different reasons. Just be sure to take the time every so often to actually get to know the birds that you’re using as a photography subject, adding to a checklist or offering tidbits at a feeder. This entry was posted in Birding, Birds and tagged Birding, birds, Bristol Herald Courier, Carter County Compass, Elizabethton Star, Erwin Record, Feathered Friends, McDowell News, Our Fine Feathered Friends, The Erwin Record on June 28, 2015 by Bryan Stevens.